In St. Anthony, MN - tucked along the shores of Silver Lake - sits Silverwood Park. Trails offer beautiful views of the lake, restored prairie, and mature oak forests that surround the park. Inside the park’s Visitor Center is the Great Hall – a large, beautiful banquet hall that is perfect for wedding ceremonies, receptions, family reunions, company parties, or other special events for up to 272 guests. The tall wood ceilings, beautiful chandeliers, and large glass windows overlooking Silver Lake provide you with an “up north” atmosphere. Amenities include indoor tables and chairs, a sound system with built-in speakers, microphone, disk changer, iPad jack, projection screen and projector, outdoor fireplace with firewood, dressing room and catering kitchen. 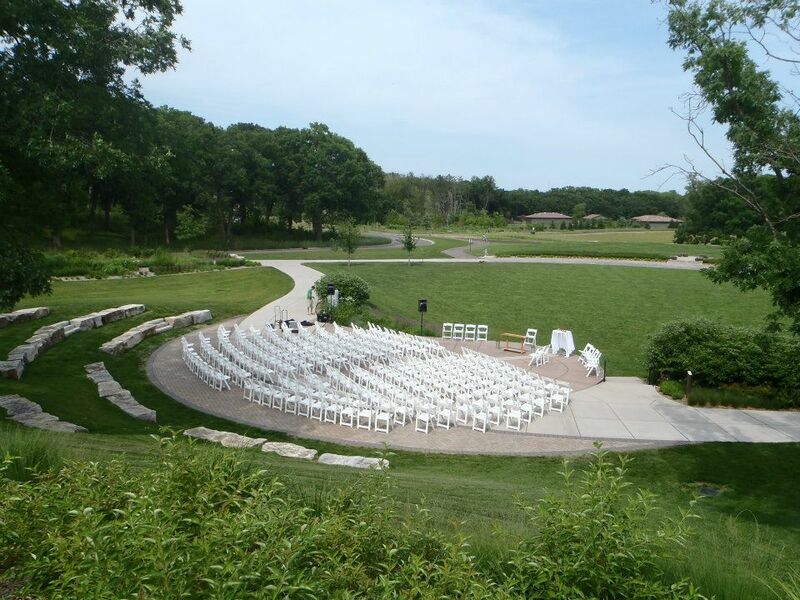 Before heading to The Great Hall for your amazing wedding reception you can say “I do” surrounded by mature upland oak forest at the Silver Lake Amphitheater. The natural beauty of the outdoor amphitheater, which over looks Silver Lake, provides a gorgeous location for an outdoor ceremony. Also available for rental are The Silverwood Classroom and Island Picnic Shelter. The Silverwood classroom, complete with Wi-Fi, is perfect for small parties, business meetings, bridal/baby showers, and staff retreats for up to 32 guests in a banquet-style layout. The Island Picnic Shelter, provides yet another space for your outdoor ceremony, picnic, reunion, birthday party, or other special even. Up to 50 people can be seated around the picnic area. Included in the rental are six picnic tables, two charcoal grills, use of the fire pit, and a bundle of fire wood. The most rustic of the four locations, the Island Picnic Shelter is only available from 9am until sunset.